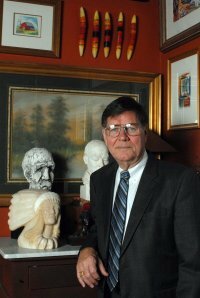 Lemoine graduated from Centenary College in 1968 and obtained his Master’s of Education from the University of Southern Mississippi in 1978. He later acquired a Masters Plus 30 and worked in the public school system his entire life. He served as superintendent of Lafayette Parish School system from 2007 until 2011. He has been a member of many professional organizations, including Louisiana Redesign for Educational Excellence, UL at Lafayette – Committee Member; State Superintendent’s Task Force on Arts in Education; State Superintendent’s Technical Advisory Committee): Lafayette Parish School Board Strategic Planning Committee – Committee Member; Louisiana State Beta Club Council; State Staff Development Committee; and Louisiana State Department Profession Development - Task Force Member. He also serves in many other community organizations such as Lafayette Blue Ribbon Committee, 1998-1999; Acadiana Safety Association, Board of Directors, 1997-1999; La Commission Des Avoyelles (Executive Committee Member); Hypolite Bordelon Society (Marksville) (Board of Directors); Le Theatre Des Bon Temps (Avoyelles Parish) (Board of Directors); Arts and Humanities Counsel of Avoyelles Parish (Charter Member); Marksville Prehistoric Indian Park (State Commemorative Area) Advisory Committee, 1980 - 1981, chairman; National Trust for Historic Preservation; Louisiana Preservation Alliance; Louisiana Craft Guild - Board of Directors 2013 to present; and Breast Center of Acadiana Foundation - Board of Directors 2014. Finally, he has received many awards, including the Central Louisiana Chapter of Phi Delta Kappa, Outstanding Teacher Award, 1978 – 1979, and he was listed in Who’s Who in America, 1980.